St Saviour Saint Saviourgate is on the south-east corner of Saint Saviourgate and Hungate. First mentioned in 1088-1093, when part of St Mary's Abbey, it comprises nave, north and south aisles, vestry, and west tower. Much of the church was entirely rebuilt about 1450, and again in 1844 (except for the tower). The church was closed and the parish united to All Saints Pavement (below) in 1954, the building serving as a store for York Museum. It is now the Jorvik 'Dig'. 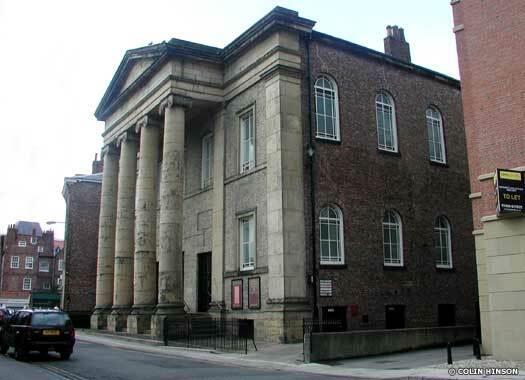 York Central Methodist Church is on the northern side of Saint Saviourgate, midway between Colliergate and Hungate. It was opened in 1840 as the Centenary Chapel after New Street Chapel was found to be too small. Hit by fire in 1863 and 1864, it was rebuilt. Nearby, Exclusive Plymouth Brethren met from about 1861 to 1937 in Salem Chapel School, St Saviourgate, reached through Webster's Passage between Nos 19 and 21 on the west side of the street. The Church of St Crux Pavement stood at the southern end of the Shambles, while St Crux Hall still stands on the northern side of The Stonebow, between Colliergate and the Shambles (behind the former church on its eastern flank). The name is a corruption of 'Saincte Crusses', or Holy Cross Church. Carved Saxon cross fragments have been found on the site, but nothing is known of the first church building. The first mention of it is from the Domesday Book of 1085-1086. 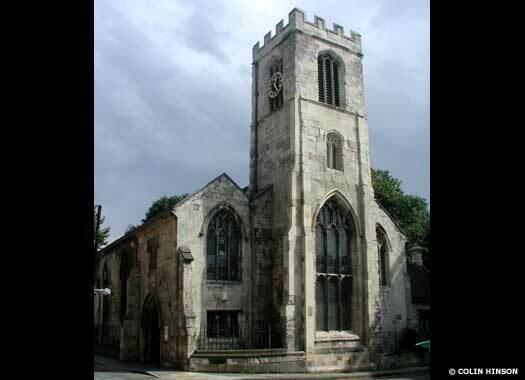 The church gradually fell into disrepair, and all but the tower was rebuilt in stone in 1424. The tower was rebuilt in the Italian style in 1697, red brick with stone dressings, a cupola on top with a large weather vane and stone 'vases' at each corner. Poor foundations meant that it slowly declined. The Victorians considered it 'unsightly'. The stone vases were missing by 1881, and the cupola collapsed in 1872. It became unsafe and was demolished in 1887. Only the hall (here) remains. 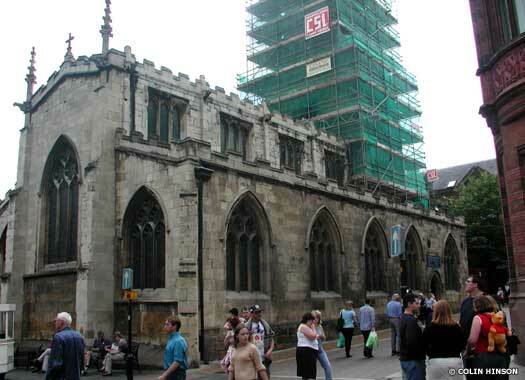 The Parish Church of All Saints Pavement lies inside the fork of High Ousegate and Coppergate at their eastern end. 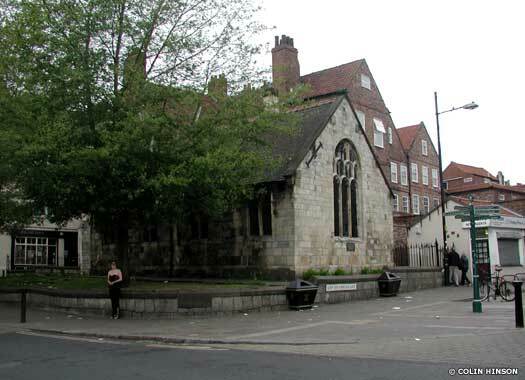 According to tradition the first church on this site was built in 685 for St Cuthbert, but archaeology can find nothing earlier than the tenth century building erected in Scandinavian York. This church was mentioned in the Domesday Book, and was probably destroyed by a complete rebuild in the eleventh century. More rebuilding was carried out in the 1500s. In 1336-1671 a row of houses stood in the church yard to maintain a chapel to the Virgin Mary. These were replaced by a market cross, given by Marmaduke Rawden, which itself was removed in 1813. 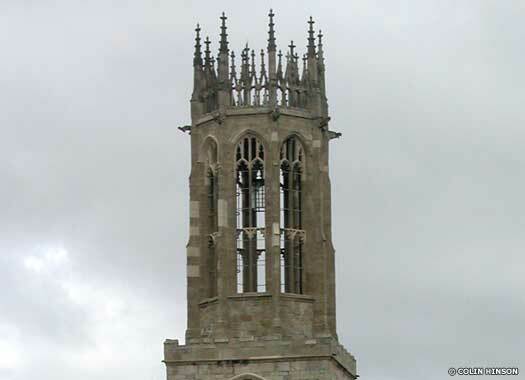 In 1400 the lantern tower was added, along with a clerestory and battlements about 1440. 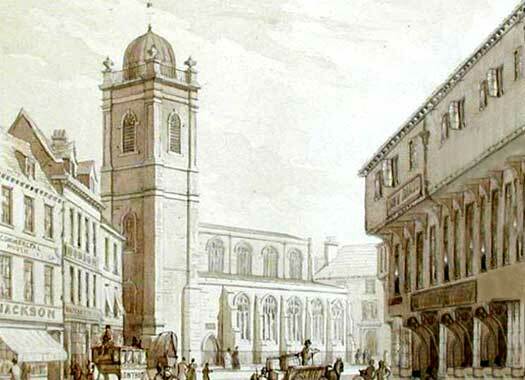 So that the market place could be enlarged, the chancel and aisles were removed in 1782 and a new east wall built. 1834-1837 saw extensive restoration of the tower and lantern. 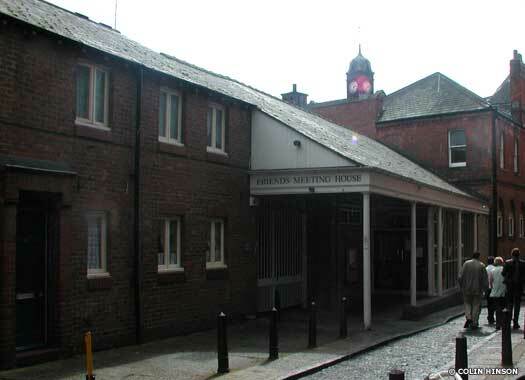 Friends Meeting House (Quakers) is on the southern side of the narrow Friargate. This is one of the larger Quaker meetings with perhaps upwards of a hundred present. Quakers were in York in 1651, but it took until 1674 for some tenements adjacent to Friargate to be adapted as a formal meeting place. In 1718 a new, much larger, meeting house was erected on the west side of the old one, but this was taken down in 1816 and replaced by the present building. Six photos on this page contributed by Colin Hinson. 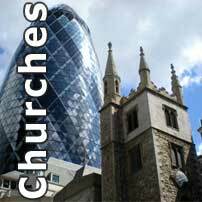 A rapidly growing index of churches of all denominations in the British Isles. You can help this amazing series grow by sending us your photos or audio files. Images and text copyright © all contributors mentioned on this page. An original feature for the History Files.